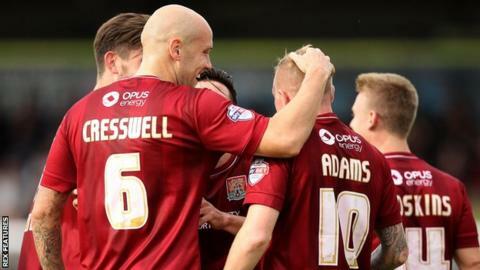 The Cobblers had been taken to court over £166,000 of unpaid taxes. Players and staff were not paid in October. Administration petitions have to take precedence over winding-up petitions, and the council decided to bring it against the club "in a bid to buy time to pull together a rescue plan" and give it "more control over the club's future". This administration petition was planned to allow more time for takeover talks, with former Oxford United chairman Kelvin Thomas interested in buying the club from current owner David Cardoza. Last week it was confirmed that Thomas was in advanced discussions with the council over the club's debt. The council loan was given to the club to redevelop Sixfields Stadium, including a new East Stand, which has not been completed. Following the adjournment of the winding-up petition at the High Court in London, a Cobblers statement read: "The club's role is currently to provide assistance where necessary to the ongoing process and to ensure that through this period the club continues to operate as normal. "We understand this is a difficult situation for supporters and we would like to thank all supporters for their continued patience and support."